How did the removal of 55,740 pounds of algae affect water quality in Georgica Pond? Last year, The Friends of Georgica Pond supported a project to harvest macroalgae from Georgica Pond to remove excessive nitrogen and phosphorus. A study of the effort by Stony Brook University demonstrated that water quality conditions were vastly improved in 2016. You can read a news article about this here. This week, the levels of blue green algae in Georgica Pond have now increased above the NYSDEC threshold for a ‘bloom’ and thus Georgica Pond will be listed among the many bloom sites starting today. This will also trigger a press release by Suffolk County alerting the public; there will be seven (7) sites across Suffolk County listed tomorrow. There are also now four sites in NYC. Blue green algae are a concern for human, animal, and ecosystem health as they can produce biotoxins, disrupt food webs, and cause low oxygen levels. As a point of reference, in 2014 and 2015, the blue green algae bloom threshold was exceeded in late July and early August, respectively. The earlier bloom is almost certainly related to the closed nature of the Pond since early spring which has filled the Pond with nutrient-enriched freshwater and driven the salinity down to levels permissible for blue green algae. The Gobler Lab has been continuously monitoring blue green algae this year. Levels through mid-June were undetectable but populations began to appear last week and this week, exceeded the threshold in the southern part of the Pond only. Levels in Georgica Cove and at the north of the Pond are elevated but below the NYSDEC threshold. Microcystin, a blue-green algae toxin, is present in Georgica Pond but below the drinking and recreational levels of concern (< 1 ug/L). The Gobler Lab will continue to monitor and provide updates regarding the situation. Given the warm temperatures and closed nature of the Pond, it is likely levels of blue green algae in Georgica Pond will increase in the coming weeks. As the mild winter has transitioned to a cool spring, and summer approaches, Georgica Pond is springing to life, good and bad. To recap, in 2015, the ocean inlet or cut remained open for the longest period in recent record, from January through late June, and the water quality remained good through most of that period although the macroalgae or seaweed or had begun to grow and expand across the Pond through June. Once the cut closed, it seemed to trigger a cascade of events that included the Pond being densely blanketed from bottom to surface with macroalgae for most of July followed by the decay of the macroalgae and the emergence of toxic blue-green algae in August and September. During the peak of these blooms, night-time oxygen levels that reach zero on several occasions and multiple species of fish were found to perish. The re-opening of the cut on October 8th 2015 ended the cycle, flushed the blue-green algae out of the Pond, and essentially ended the season of environmental threats to the Pond. The cut went through numerous iterations of open and closed thereafter, but last closed in late March of this year. 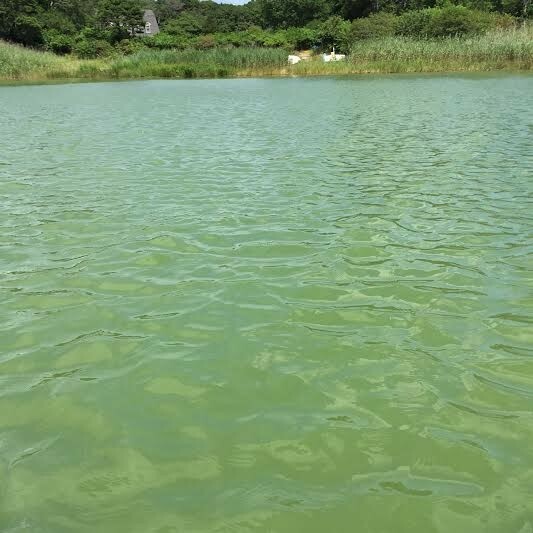 The installation of the Stony Brook University water quality buoy has facilitated a clear picture of how Georgica Pond has responded. Following the closing of the Cut, salinity quickly dropped from 30 in early April to 15 by late April and presently being about 9 (see figure below, red line). At the same time, a dense microalgae bloom has developed in Georgica Pond (see figure, purple line). The causative species, Prorocentrum minimum, is also known as Mahogany Tide due to the dark brown color it yields in the water. Unlike the blue-green algae, this species is not a human or pet health risk, but its high densities can have some ecosystem impacts. Firstly, it is known to be harmful to oysters and scallops. Next, the very dense shading it causes is inhibitory to the growth of submerged aquatic vegetation (SAV). In some ecosystems, that is a large concern, as the dominant SAV is eelgrass, an important fish and shellfish habitat. In Georgica Pond, however, this might be a bit of good news, as the shading brought about by the Mahogany Tide seems to be inhibiting the growth of macroalgae. While unsightly macroalgae had already been proliferating through much of Georgica Pond last May and June, thus far in 2016, it has been at very low levels. What will happen next in Georgica Pond is uncertain. The East Hampton Town Trustees had hoped to open the cut last month, but were unable to do so due to the nesting of Piping Plovers (an endangered species) on the ocean beach. Mahogany Tides are typically seasonal and as the Pond continues to warm, it is likely the Mahogany Tide will wane. Open questions include: 1. Whether / when blue-green algae might bloom in Georgica Pond? The salinity of the Pond is already permissive for such an occurrence but during the past two years they occurred only after blooms of macroalgae. 2. Whether / when macroalgae might bloom in Georgica Pond? If the Mahogany Tide clears up, the macroalgae may soon follow. 3. When will the cut next be open? Plovers typically nest through the summer, and the next opportunity may be next month. Further updates on Georgica Pond will be provided through the season. Stay tuned. What began as a mild green discoloration in early August and intensified to the largest blue-green algae bloom ever recorded in Georgica Pond by early September has finally come to an end. In between, the bloom was accompanied by no oxygen conditions, fish and eel kills, and discontent among Pond residents. The end came quickly for the blue-green algae. As predicted, within hours of the ocean cut being opened last Wednesday October 7th, blue green algae began to be flushed out into the Atlantic Ocean. Within four days of the opening, the blue green algae had all but vanished from Georgica Pond. Blue-green algae thrive in low salinity, high temperature, and nutrient-rich water. Hence, beyond the action of physical flushing, blue green algae could not physiologically tolerate high levels of salinity brought by the influx of ocean water from the new cut. Given the seasonally dropping temperatures, it is highly unlikely that blue-green algae will be seen in Georgica Pond again in 2015. As the summer winds on, the blue-green algae bloom in Georgica Pond has expanded and intensified. Remember, blue-green algae are of serious concern as they synthesize toxins that can sicken humans and can be lethal to pets and other animals. Here is the latest information regarding the blue-green algae bloom in Georgica Pond. The small bloom that originated in the southern end of the Pond only on August 12th has now spread into Georgica Cove and into the north end of the Pond as well. The biomass levels presently in the Pond (>400 micrograms of blue-green algal pigment per liter) are the highest levels we have recorded since we began monitoring in 2013. In good news, this bloom is currently displaying low levels of toxicity. We have analyzed samples for the neurotoxin, anatoxin-a, and it was not present in the Pond. We have analyzed samples for the gastrointestinal toxin, microcystin, and the levels were 1 micrograms per liter. This is at the World Health Organization’s limit for safe drinking water, so no one and no animal should be drinking from the Pond. However, the World Health Organization considers 2 micrograms per liter a low recreational risk and hence the current levels are NOT a recreational risk according to this standard. As predicted earlier in the year, blue-green algae did not start to bloom in Georgica Pond until the salinity of the Pond dropped to a low level as they cannot tolerate high salt levels. This year’s trigger point seemed to be about 13 grams of salt per kilogram of water. 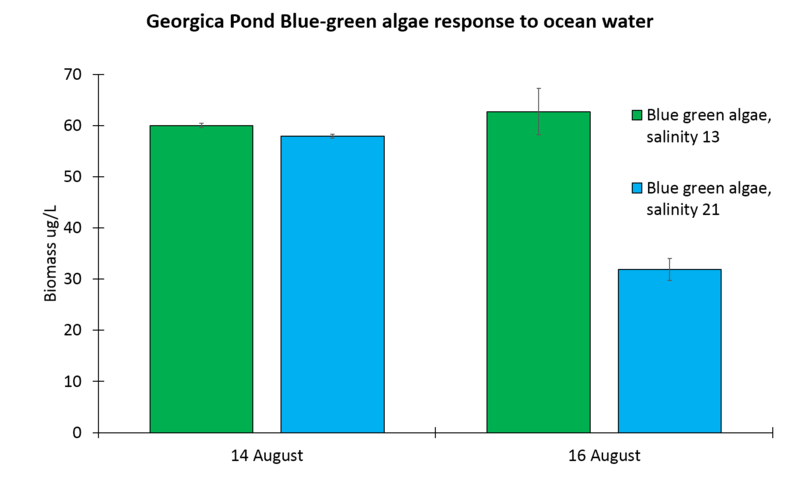 To prove this point further, my lab recently performed a bottle experiment of adding ocean water to Pond water, raising the salinity to 21 grams per kilogram and found it reduced blue green algae levels by more than 50% in 48 hours. Hence, opening the cut would eliminate the blue-green algae in two ways: physically by flushing and physiologically by killing them off. A dense bloom of blue green algae has developed in Georgica Pond during the past week, marking the second consecutive year of such an event. The NYS Department of Environmental Conservation has set a threshold level 25 micrograms of blue-green algae per liter of water as the concentration above which a public notice is provided to warn citizens against exposure to blue-green algae some of which can produce toxins that can poison animals, particularly small dogs, that may consume the water. Levels in Georgica Pond exceeded 100 micrograms of blue-green algae per liter per liter late last week. There had been hopes that the extended opening of the inlet during the first half of 2015 would discourage the growth of blue green algae which thrive only in fresh and low-salinity brackish water, and this seemed to be the case as blue-green algae first emerged earlier in the summer in 2014, specifically in mid-July. However, the natural flow of stream and groundwater into the Pond has progressively driven the salinity levels down from 31 PSU (practical salinity units) in late June, 2015 to below 14 PSU by early August. Certain types of blue-green algae, including the specific types found in Georgica Pond, can grow at salinities of 15 PSU and lower. The Anabaena algae found in the pond has the potential to produce gastrointestinal toxins and neurotoxins. Low levels (1 microgram per liter) of the gastrointestinal toxin, microcystin, were present in Georgica Pond last week. The World Health Organization has set a drinking water threshold of 1 microgram of microcystin per liter but only considers levels above 2 microgram of microcystin per liter a recreational risk. We suspect that the neurotoxin is also present but have not yet verified that. Dr. Christopher Gobler, a marine science professor at Stony Brook University, has been studying the Georgica Pond for the East Hampton Town Trustees since 2013 and this year began a study supported by Pond users and residents to identify the sources of nutrients to Georgica Pond as well as measures to mitigate resulting environmental problems including blue-green algal blooms. Gobler further noted that in 2014, the blue green algae bloom persisted from July through October but vanished within days of the cut or ocean inlet being opened by the East Hampton Town Trustees on October 15th. The Friends of Georgica Pond Foundation, a group considering the interests of all those who use Georgica Pond and/or work or reside in the greater Georgica Pond watershed are primarily concerned with protecting human and animal health and thus supports efforts to remediate the situation based on the scientific evidence presented in Dr. Gobler’s ongoing study. The East Hampton Town Trustees will meet on August 11th to discuss possible responses to this bloom event. For those of you who missed yesterday’s seminar or would like to review the presentation, it is posted here for your perusal. One year ago, Georgica Pond was closed to bathing and shellfishing, a closure that persisted for more than three months. The reason for this closure: Toxic blue-green algae. Also known as cyanobacteria, these microbes synthesize potent neurotoxins and gastrointestinal toxins that were responsible for dog and other animal deaths on Georgica Pond in recent years. In 2014, the blue-green algae bloom began on July 23rd, intensified through the summer and fall, but disappeared when the inlet or cut to the ocean was opened in October. Knowing that blue-green algae thrive in fresh and brackish water, it was recommended that leaving the inlet open as long as possible in 2015 would discourage blue-green algae blooms. Affirming this hypothesis, leaving the inlet open has left the salinity in the Pond more than twice the levels observed last year and the blue green algae are nowhere to be found. 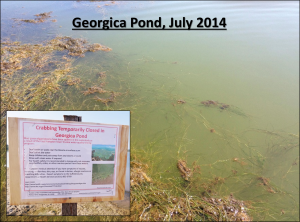 While there is still much to do regarding the health of Georgica Pond, it seems that managed openings of the Georgica Pond inlet can play a role in discouraging blue-green algae. As a reminder, Dr. Gobler will provide an oral report on Georgica Pond at the residence of John and Annie Hall this Saturday August 1st at 9am. He looks forward to seeing many of you and answering your questions. The New York State Department of Environmental Conservation (NYSDEC) keeps careful tabs on blue-green algae (BGA) across the state and the Gobler lab has been designated as its downstate facility for monitoring BGA and thus receives samples from dozens of locations through the year and more than a dozen sites weekly. As a reminder, BGA are a serious concern as they can synthesize toxins that can poison animals or humans. BGA blooms are presently occurring through multiple sites on the East End and in NYC, including Central Park Pond. There are more than seven sites with BGA blooms across eastern Suffolk County and on Friday, Wainscott Pond was added to the list. Located ~2,000 ft west of Georgica Pond, it shares many of the same properties including nutrient loading sources. The very major difference between the two sites right now is the salinity. The salinity of Wainscott Pond is zero; it is a freshwater body which is the environment BGA thrive within. The salinity of Georgica Pond is presently 16; too high for the growth of BGA. This elevated salinity is due to the fact that Georgica Pond was open to the ocean from January through June this year. The complete list of locales experiencing BGA in NYS can be found here.